Jeff Wilson knows a thing or two about making the most of small spaces—he spent a year of his life living in a 33-square-foot dumpster as part of a social experiment. It was during that time that he was inspired to develop the Kasita, a tiny, self-contained studio apartment he believes could be the answer to the nation’s growing housing crisis. The “mobile home” is a 10-by-20 foot steel box that comes with a dishwasher, washer/dryer, and a subwoofer in the floor (that’s already more than you can say for many urban apartments). Unlike a trailer, this living space is designed for the heart of downtown. The vision behind the design is that the units will eventually be able to be stacked on top of one another. A building frame called a “rack” would be able to house several Kasitas at a time, providing them with water, electricity, and other utilities through hookup valves. And if a renter ever needed to move to a different location, the unit could be removed via crane and popped into a different rack elsewhere. This type of network is the ultimate goal for Jeff Wilson and the team behind the Texas startup. 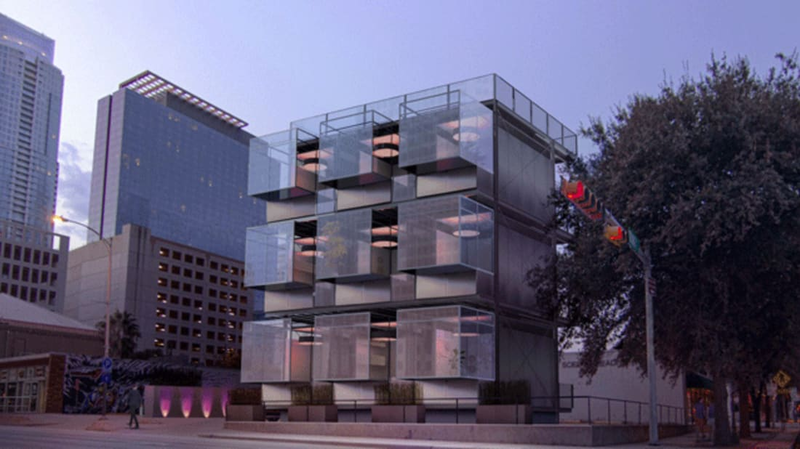 They’ve already built their first prototype and leased the space for a rack in Austin, where some units could go for as little as $600 per month. Wilson believes the opportunity for residents to have a true, personal space of their own is a major part of the Kasitas’ appeal. "One of the things we're trying to solve for is having your own place," Wilson told NPR, "and not getting on Craigslist and finding a bunch of roommates that have too many cats and too much bong water left out on the dining room table." To give the prototype the illusion of space, they used design tricks like white walls, high ceilings, and reflective surfaces. The front wall is a fully enclosed, glass balcony, where hypothetical residents would be able to look down at the street below. Not bad for a dwelling inspired by a dumpster, huh?